Public education will continue to face financial challenges. Through our work, we help education leaders understand the implications of current and alternative ways of distributing dollars and help those leaders use every dollar to maximize benefits for students. A more productive education system is both more financially sustainable and yields better student outcomes. Emerging financial data will make it easier to link outcomes with spending, surfacing schools are most able to leverage their money to maximize student outcomes. And it will allow all schools (and systems) to benchmark progress toward improved productivity. 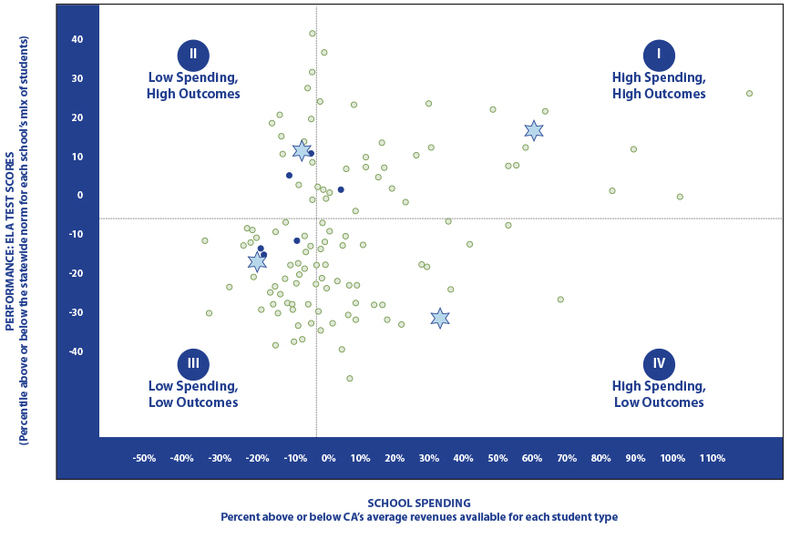 Our productivity analyses, shown in the graphic above plotting per-pupil spending and student outcomes by school. These sorts of analyses can help system leaders discover innovative practices, benchmark districts and schools and manage for continuous improvement.